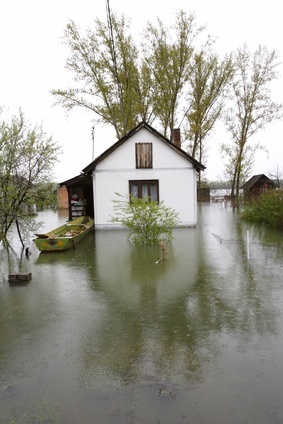 Whether your property is damaged by a flood, burst pipe, or roof leak, getting it restored quickly is a top priority. Your home insurance may cover some types of water damage, but you will probably end up paying some of the cleanup costs yourself. To minimize water damage (and cost) and avoid problems with mold growth, remove standing water and dry out your possessions as quickly as possible. From there, a water damage remediation service that works within your budget will be invaluable. Category 1 is essentially clean water. Because it generally does not imply serious health and safety concerns, this is the least expensive type of water remediation. This type of water usually comes from a burst supply pipe or a faucet left on. Category 2 is dirty water that is not seriously contaminated. This type can come from an overflowing dishwasher or washing machine. Category 3 is water that is dangerously contaminated, such as raw sewage. This type of water poses serious health and safety risks and repairing damage from this kind of water is usually expensive. The cost of the project also depends on the size of the affected area. Repairing damage in a relatively contained area will be less expensive than an entire house remediation. The cost to fix water damage varies greatly depending on the area and type of damage. Damage from a leaky roof is usually contained to a small area and involves category 1 water. For this, you can expect to pay a few hundred dollars. A burst pipe affecting a larger area can cost tens of thousands of dollars. This kind of water damage can affect a wider area. It also depends on whether the water came from a supply pipe with clean water or a discharge pipe with category 2 or 3 water. Flood restoration costs range from $7,800 to $26,000, depending on the depth of the water, according to the National Flood Insurance Program. Minimize the cost of water damage cleanup by starting to dry the area and your possessions within 24 hours. Mold will begin to grow if water remains longer than 24 hours, and removing mold will incur further costs. To minimize the area affected by water damage, shut off the water supply as soon as a leak is detected – the sooner, the better. A simple water alarm can detect moisture and automatically shut off the water supply. This costs between $50 and $150. These devices can prevent large-scale flooding from a broken appliance or water heater, saving you thousands of dollars. Finding a reliable water damage remediation service that you can afford is simple when you use the directory at RestorationMasterFinder.com. Read customer reviews to find the best cleanup service in your area and avoid unreliable or overpriced companies.